In 2004, the fields of Drummond House, the Collier family's 100-acre farm in Baltray, Co Louth, an hour north of Dublin, were used as car parks for the Irish Open, and as a landing pad for helicopters flying in golf fans who didn't want to sit in traffic. Now, thanks to the efforts of Peter and Marita Collier, Drummond House is home to a successful Irish garlic business, and this year will see the farm's first full crop of Irish asparagus, a springtime delicacy that's prized for its delicate, fresh flavour. "Drummond House has been in Peter's family for 150 years," says Marita, who worked in sales and marketing before re-inventing herself as a garlic farmer. "It used to be mixed dairy and tillage, with some beef cattle, but the land had been rented out for years. Peter is an architect and he works full-time as a project manager for the DAA, I was looking to start a business from home. Farming is so uncertain that we decided to look upon it more as a business than a farm, with the hope that we could develop something sustainable for the future." With Drummond House garlic thriving - products include elephant garlic, smoked garlic and fermented black garlic, as well as garlic scapes - Marita decided that it was time for Drummond House to venture into another crop. "In deciding what we were going to grow," says Marita, "we wanted to choose something that nobody within 50 or 100 miles of us was doing - there's no point falling out with neighbours or encroaching on their territory. Also, in terms of timing, the asparagus kicks in when the garlic tails off, which is good for cashflow. It may only be worth €8,000-€9,000 a year to us at the moment, but to a small farmer that's a significant sum. It's a premium product, we can produce it in limited quantities and because we own the land the risk is limited. "Asparagus was actually quite a common crop throughout Ireland in the past, but there's been very little grown here in recent years. We approached a family of specialist growers in Holland for advice. They have been in business for 80 years and they came over to look at the farm before suggesting the varieties of asparagus that we should be growing based on our soil, climate and site. 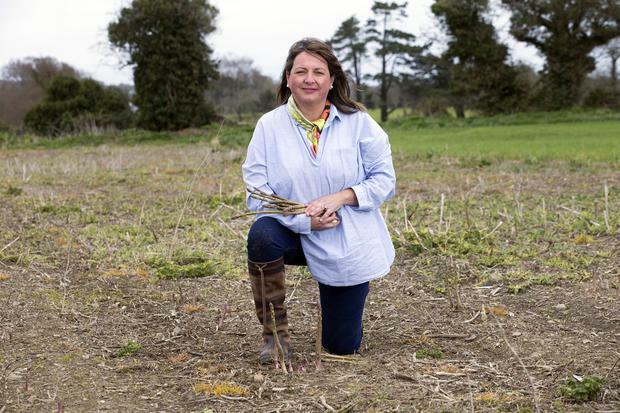 "It turns out that the sandy lung soil of Drummond House is ideally suited to asparagus growing; and in fact many years ago 40 acres of asparagus were grown right on our doorstep, in An Grianán Horticultural College. "The growers recommended two different varieties out of the hundreds that exist. Asparagus is an amazing crop in that it will grow in any situation if you have the right variety. The reason that there is so much asparagus grown in Peru and Mexico nowadays is because the governments in those countries incentivised farmers to switch to asparagus from growing coca leaf, which is a drug crop." The Colliers purchased 11,000 asparagus 'crowns' from the Dutch growers and planted them on a two-acre site in March 2015. "A crown looks a little like the top part of a jellyfish, with roots like tentacles coming out of it," explains Marita. "The spears grow out of these roots. You plant the crowns about eight inches deep in beds that are a metre apart and spread out the roots. We are only 800 metres from the sea here and we get lots of high winds, which means we have soil erosion. Because of this, we were advised to plant on the flat rather than in raised beds." Asparagus takes three or four years to become fully established, so it's a crop that requires patience on the part of the grower. "The plants grow in a few months, but the stalks are very wispy," explains Marita. "They turn into a fern that's full of sugars and nutrients, which you mulch back in, top-dressing the plants with mushroom compost and horse manure to feed the crown. The second year the plants came back stronger, but we harvested nothing and did the same again. Last summer, which was year three, we just harvested the thick, strong stalks and left the wispy ones. We hope to get our first full yield - about a tonne - this year." The asparagus season is a short one - traditionally it ends on the longest day of the year, June 21 - with Marita and her team of local women ("other mums that I met at the school gate") harvesting twice a day, once at six in the morning and again around four in the afternoon, seven days a week. "Asparagus can grow 6-8 inches in the space of 24 hours," she says. "We cut it all by hand, take it to the pack house, rinse it and put it into the chill room standing up in water; you treat it like a flower. It has to be chilled within an hour of harvest to keep it sweet." Last year, the demand for Drummond House was such that it far outstripped supply. In Dunnes in Cornelscourt, 120 200g bunches priced at €4.99 each sold out within three hours, and chefs from prestigious kitchens competed for the delicate spears, promising to do them justice. "The chefs here know their asparagus," says Marita. "I was really blown away by the interest, they all wanted to get their hands on it. It was a real vindication for the way we had minded and nourished the crop. The closest thing is the Wye Valley new season asparagus from Herefordshire. It's not hard or woody at all, it tastes like really fresh peas, it's nearly too nice to cook." In terms of flavour and texture, the Drummond House asparagus is absolutely delicious, completely different to the imported asparagus that we are used to in Ireland, with an inherent saltiness that comes from being grown so close to the sea. This year, Drummond House asparagus will be available in small quantities at a few selected retailers including branches of Avoca, Fallon & Byrne and Donnybrook Fair, as well as in smaller shops including The Village Butcher in Ranelagh, and Fruit4U in Naas, both of which are year-round supporters of Drummond House garlic and other crops from small growers supplied by vegetable distributor, Sean Hussey of St Margaret's in North County Dublin. Chefs keen to get their hands on the first 2kg box of new season asparagus can bid in an online auction in aid of the Irish Cancer Society, a cause close to the hearts of Marita and Peter Collier and Sean Hussey (who came up with the idea), on Twitter, starting at noon today and ending tomorrow (Sunday) evening at 6pm. Follow @DrummondHGarlic for details. 1. First for the sauce: In a small pot mix the white wine and white wine vinegar, bring to the boil and reduce by ¾ to concentrate the flavour add the cream turn the heat down and allow to lightly simmer for 1 minute, in the meantime dice the butter into small cubes. Remove the pot from the heat and start to whisk in the cubed butter bit by bit until fully incorporated, season the sauce with a good squeeze of lemon and salt to taste. 2. For the asparagus: Bring a medium-sized pot of water to the boil and add 1 tablespoon of salt to it. When the water is rapidly boiling, add the asparagus and set a timer for 45 seconds. When it beeps, remove the asparagus and lightly season with salt and pepper. 3. 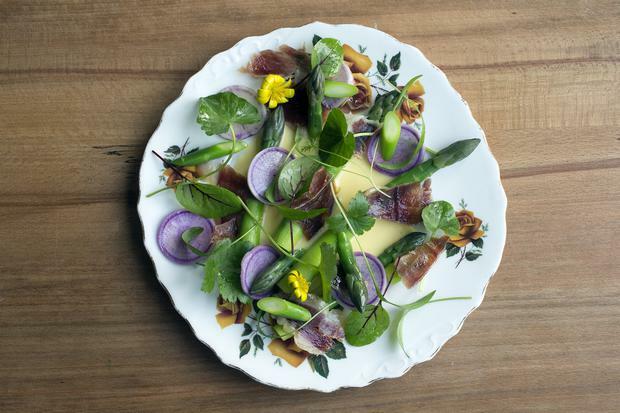 To plate: In the centre of a plate add 3-4 generous spoons of the beurre blanc sauce then place the asparagus on top, roughly tear the ham and scatter on top along with the water cress and finish with a twist of black pepper. This is super simple but with good asparagus and good ham you can't go wrong. Things to note: when whisking the butter into the sauce, if the mix cools down too much, to incorporate all the butter you can return to the heat for 5-10 seconds when needed until all the butter is emulsified. Again this is a very simple dish but with good asparagus you don't need to complicate things, things to be aware of are to not burn the butter for the sauce, a light brown butter is what you're looking for. 1. First step is to remove the woody end of the asparagus - rule of thumb here is to find the natural breaking point at the end of the asparagus and snap it off. You can then lightly peel the asparagus and trim the end with a knife but this is not essential. Bring a medium-sized pot of water to the boil and add a tablespoon of salt, add the asparagus and set a timer for 3 minutes. In the meantime, turn the grill to a med-high heat. When the timer beeps, remove the asparagus and pat dry. Lightly season with salt and pepper and place on a metal tray top with the slice of Durrus cheese. 2. Peel and segment the lemon and roughly chop 3 large segments of lemon and set aside for later. 3. Add the 100g of butter to a pan on med-high heat, melt the butter and continue to cook until it starts to turn a light brown colour. Remove the pan from the heat and add the chopped lemon segments, hazelnut, capers and parsley as well as a pinch of salt and a twist of black pepper. 4. Place the asparagus under the grill just until the cheese begins to melt. 5. To plate up: Using a spatula lift the asparagus from the tray and place in the middle of the plate and spoon on the caper and lemon butter. 1. Start by preparing the poaching liquid for the fish, in a medium-sized pot (just big enough to fit the trout). Mix the water, 100ml white wine, 100ml white wine vinegar, 2 star anise, 3 peppercorns, ½ of any leftover tarragon stalks, 1 shallot peeled and split in half and 2 cloves of garlic and bring to a very light simmer. 2. Next, prepare a reduction to season the bearnaise sauce: slice the remaining 3 shallots and add to a small pot with the remaining tarragon stalks, peppercorns, white wine and white wine vinegar. Put on a medium heat and reduce the liquid by ⅔ and leave to cool. 3. Next, start to make the sauce. Roughly chop the butter and place it into a small microwavable container, cling film the top and put in the microwave on medium to high heat for 2-3 minutes. You should notice that the melted butter has separated into clear clarified butter on top and the milky solids in a layer at the bottom. Pour the clarified butter into a separate container and keep for the bearnaise, and keep the milky layer for the asparagus. 4. In a small metal or heat-proof bowl, whisk together the egg yolk and half the vinegar reduction over a pot in which there are a couple of inches of simmering water; this is known as a bain-marie. The bowl should not touch the water. Whisk the egg yolk mix continuously for 2-3 minutes until the mix becomes pale and fluffy, it should double or triple in size as air is incorporated into the mix. Slowly but steadily trickle in the clarified butter while whisking until all the butter is incorporated, this can be made easier by removing the pot from the heat and placing on a wet towel to stop the pot from moving. When all the butter is in, remove the pot from the heat, add the chopped tarragon, a few squeezes of lemon, the rest of the vinegar reduction and salt to taste. 5. Now for the fish. Drop the fish into the previously prepared poaching liquid which should be at a light simmer. Once the fish is in, wait for the water to come back to a very light simmer and turn the heat off completely. Set a timer for 4-6 minutes depending on how you like your fish. Personally, I like my trout a touch undercooked so I would opt for 4 minutes. In the meantime, boil a pot of water and add a tablespoon of salt. When the timer beeps, remove the fish with a slotted spatula and pat dry on kitchen paper. 6. Drop the asparagus into the rapidly boiling salted water and set a timer for 45 seconds. When it beeps, strain off the water and toss the asparagus in the reserved butter solids. 7. To plate: Assemble the asparagus spears in the centre of the plate, top with the piece of trout and spoon a large dollop of bearnaise on top. Trout, asparagus and bearnaise is really a marriage made in heaven - really simple but super tasty, fit for the family table and on a restaurant menu. A little care is needed in the sauce preparation. Things to note are not to let the bain-marie get too hot as it may scramble the eggs. If you're worried, remove the pot from the heat.